Change of plan, my three Ysabel books are of such uneven lengths, from longish to very short, that a trilogy won’t work unless I shove a new plot into book three, which I don’t want to do. So, the trilogy becomes a duology. I have to figure out how to recut the three books into two books of fairly similar lengths, with each one standing on its own. There is a natural resting place in the middle of the whole story, but I’m not sure that it’s the best place to end one book and start another. This is the topic of my next meeting with my editor. To prepare, she has given me the task of describing Ysabel’s hero’s journey. This has been an excellent way to find holes in the story and find a better place to divide Ysabel’s journey. Speaking of holes, my editor found a gigantic one that affects the entire second book. 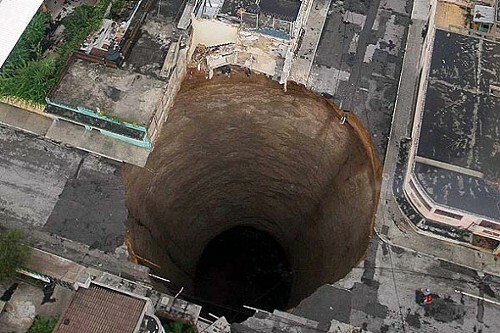 It’s a sinkhole of a hole and I’m embarrassed that I didn’t catch it. The fix isn’t hard, just a lot of rewriting. This entry was posted in Writing by Signe Kopps. Bookmark the permalink.